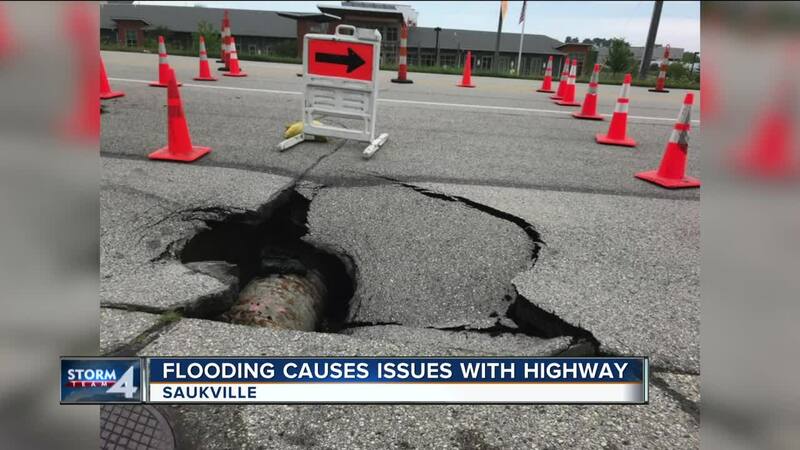 SAUKVILLE — Homeowners in Saukville are keeping an eye on the swelled Milwaukee River. A portion of Highway 33 is closed in both directions, because of our severe storms. A culvert underneath 33, near the Wisconsin Humane Society’s Ozaukee Campus off N. Dekora Woods Boulevard gave way to rust. A four-foot deep hole was found Monday morning. “The next part now is we need mother nature to cooperate and allow us to pave,” said Jon Edgren Ozaukee County Public Works Director. Edgren is optimistic the asphalt could be laid down by Tuesday afternoon. Some Saukville residents are finding trouble even before they leave the house. Robin Zeigler showed us how kind neighbors helped surround her home with sandbags, as the Milwaukee River continues to swell in her backyard. “Without my neighbors, this couldn’t have possibly happened,” said Ziegler. Residents are reminded to never drive over any water pooling over the road. You never know if the road could be washed out underneath. Turn around, don’t drown.